Providing expert sports dentistry services, Pitt St Dental Centre focuses on the prevention, assessment and treatment of dental problems and injuries sustained during sporting activity. Key to preventative sports dentistry is protecting your mouth during training and gameplay – where a quality sports mouthguard could save you pain and money. When it comes to competitive and contact sports, don’t overlook the importance of a good quality mouthguard. At Pitt St Dental Centre, our experienced Sydney dentists specialise in creating high quality mouthguards for sports and contact activities. Made custom to suit your mouth, our mouthguards are designed to fit perfectly in order to minimise oral and facial injuries. We choose to work with a trusted local laboratory in crafting sports mouthguards out of the most durable and comfortable materials. Creating your custom sports mouthguard is relatively simple. All you need to do is book a consultation with our experienced dentists. We get to know your lifestyle and sporting activities then comprehensively analyse your mouth, teeth and gums. We send our results to a Sydney-based laboratory that specialises in creating custom mouthguards of the highest quality, according to your colour and fit preferences. Our dentists recommend wearing mouthguards during any sport or activity where you could be knocked in the face – either by a ball, equipment or another player – including during training sessions. For adults, losing teeth or requiring dental work can be painful and inconvenient. For younger players, mouthguards are critical to protect developing teeth and facial bone structures. While DIY sports mouthguards are available in stores, they’re usually uncomfortable, poor fitting and don’t provide you with the level of protection needed to safely combat impact. They can even cause irritation and discomfort, leading to distracted gameplay, fiddling and infection. 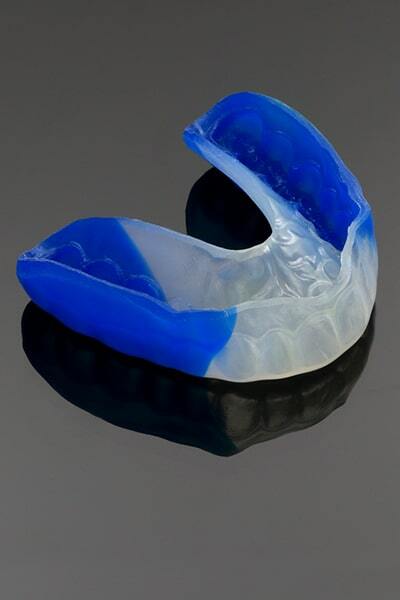 Sports professionals generally recommend against purchasing mouthguards from stores as they offer minimal protection. Custom-fitted sports mouthguards from experienced dentists always offer enhanced levels of protection, comfort and mobility. At Pitt St Dental Centre, our team of experienced dental professionals are committed to protecting your entire oral health through every stage of life. We believe that sport is an essential part of recreation, fitness and development and can lead to successful and rewarding careers. To keep you focused on your game, we create custom mouthguards to provide your teeth and entire mouth with comprehensive protection. Our sports mouthguards are designed to cushion blows and distribute forces of impact, minimising jaw fractures and potential neck and muscle injuries. Sports injuries can cause significant long term damage to oral and facial health. Without proper custom-made sports mouthguards, impact to the face and mouth can result in lost teeth, severe jaw injuries and a multitude of dental and facial concerns. In children, impacts to the face can cause dental complications and changes in facial bone structure. Protect yourself against facial sporting injuries with the professionals at Pitt St Dental Centre. Specialising in sports dentistry, our Sydney dentists create custom sports mouthguards that offer comfort, mobility and maximum protection. Find out more about our sports mouthguards – book a consultation with a dentist at Pitt St Dental Centre today.